Tripoli-based Audit Bureau chief Khaled Shakshak blamed the other relevant state bodies for lacking courage in taking the needed, but difficult decisions to reform the financial state of the country. He blamed Libya’s current woes on the Faiez Serraj-led Presidency Council/Government of National Accord (PC/GNA) and on the board of the Tripoli-based Central Bank of Libya (CBL). ”The CBL Board was not doing its job”, he complained. 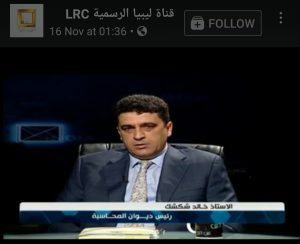 Speaking on the Libya Rasmiya state TV channel yesterday Shakshak admitted that there is a ”legislative vacuum” left by the absence of the House of Representatives (HoR), however, unlike Faiez Serraj and to an extent Saddek El-Kabber, he felt that the Serraj PC/GNA did not need the legislative approval of the House of Representatives based in Tobruk to carry out the urgently needed financial ”executive reforms”. The lengthy Shakshak TV interview comes on the back of the lengthy press conference given Tuesday by Tripoli CBL Governor in which he blamed Libya’s financial woes squarely on the Faiez Serraj-led Presidency Council. The in-depth television interview follows the similar format used by Faiez Serraj in September this year and reflects the continuing tug-of-war for public approval and for power and legitimacy by Serraj and his PC/GNA, the CBL and the Audit Bureau. It also continues the merry-go-round through the media of apportioning blame on others by the three Tripoli-based pivotal institutions: the PC/GNA, The CBL and the Audit Bureau. Reviewing the Libyan financial crisis since the 2011 revolution, Shakshak said that Libya’s financial woes started with the three-year blockade of oil installations (by Ibrahim Jadran regional head of the Petroleum Facilities Guards). He added that these blockades are still unfortunately repeated from time to time. Then the collapse of the international price of crude oil prices from over US$ 100 per barrel to under US$ 30 per barrel reduced the Libyan state’s hard currency revenues further. This was compounded by the political divisions of the country and the multiple governments, instability of institutions and insecurity. There was some hope briefly, Shakshak said, after the Skhirat talks led to the birth of the Libyan Political Agreement. He had hoped that the administrative divisions would come to an end as a result. But divisions continued, he said, and worse there emerged a ”legislative vacuum”. Legislative authority is very important, he said, in the continuation of the authority of the state and accountability. This legislative vacuum – the inability of the House of Representatives in Tobruk to impose its will – led to state institutions operating in isolation and seeking their own goals rather than act in unison, he explained. Shakshak referred to international mediation to help the contending Libyan parties to reach a consensus on financial issues. He said the meeting in London in November 2016 was an attempt to bring the viewpoints of the parties closer and fill this gap. It was somewhat successful in that it led to the ”Financial Arrangements” which solved the conundrum of the budget, he explained. This solution, based on the LPA, enabled the Serraj-led PC/GNA to bypass existing Libyan budget law which stipulates that only the country’s parliament can pass a budget. There were subsequent meetings in Rome and Tunis and others, which led to some success in solving the state budget issues. But no solutions were found for the problems faced by citizens such as high prices, inflation and living conditions. There is a need to reduce foreign exchange spending and fight corruption the instability. The vacuum and weak institutional management has created an environment ripe for corruption. State funds have become the goal of all the corrupt with weak souls. Shakshak said that the Audit Bureau had put forward an initiative to direct foreign exchange to solve peoples’ problems. The initiative proposed a special price for foreign exchange transfers so that there would be equal distribution of foreign exchange to all businesses. However, the CBL said the IMF might have objections. The proposal involved adding a tax or duty surcharge of 200% on all foreign exchange transfers to help the bank liquidity problem. But, after Serraj PC/GNA had agreed to the reform, it reversed its decision. Businesses had also objected, he said. Nevertheless, Shakshak insisted that the CBL is unable to cover all the needed LCs at the official exchange rate of LD 1.40 per US dollar. With the current system of LC distribution, there is a sort of a monopoly on foreign exchange and imports. Some had exploited this trading in foreign exchange by importing empty containers and sub- standard or expired goods to gain foreign exchange. It was foreign exchange smuggling, he explained. Shakshak said that the long term financial reform plan has been agreed by the different Libyan authorities, but there is a need for short term ones. What is needed is agreed upon already by all: experts, academics, institutions etc. When put to him that there were divisions between the CBL and Audit Bureau, Shakshak did not refute it. The Serraj PC/GNA should lead the reform initiatives as it is ultimately responsible. It should take brave decisions. Every party is avoiding taking a decision, he said adding that the Audit Bureau were just an oversight and monitoring body of public funds. He admitted that reform will face resistance by those benefiting some in prominent positions and some outside. They must be faced off, he insisted. Shakshak insisted that the Audit Bureau will not give up its powers and duties of oversight and monitoring of state funds. It will continue to refer suspected criminals to other relevant entities, he added. He said that the Audit Bureau is accused of stopping the opening of many LCs, but he insisted that there is a mechanism for opening LCs which is not being followed with many companies having LCs opened without going through the process. He insisted that the Audit Bureau did not want to stop the opening of LCs as accused, adding that the agree upon processes approved by the PC/GNA has to be completed. He pointed out as an example that some companies received LCs more than they had requested amount. The Audit Bureau objected to the way LCs and the way foreign exchange was distributed. The process is being misused and is encouraging corruption. The current system is unsustainable and should be stopped. It needs urgent reform. He insisted that the Audit Bureau was simply an oversight body and refuted accusation that it has started acting as an executive. Shakshak was convinced that Libya’s financial crisis is solvable. He said that the 2017 Temporary Financial Arrangement (budget) allocated US$ 8 bn for imports while today at the end of November only just over US$ 3 bn has been disbursed. He said about US$ 7 bn is needed for non-essential imports and about US$ 3 bn for personal use such as private education or health treatment abroad. The imports of the non-essential goods and personal use are responsible for the high foreign exchange price in the black market as no essential goods such as foods are permitted to enter officially through ports if they were not paid for by an official Letter of Credit (LC). Shakshak felt that if the PC/GNA Ministry of Finance and the CBL processed the opening of LCs faster, more efficiently and with more transparency and monitoring, there would be more supply of essential goods in the market place. This would make more hard currency available for other needs and would reduce demand for black market hard currency – thus reducing the black-market exchange price. ”The PSF is very important”, he explained as it would provide large quantities of goods and reduce prices, thereby reducing the burden on citizens and improve their living standards. In the same vein, Shakshak blamed the Serraj PC/GNA for the unjustified delay in implementing the smart card system approved to equitably distribute subsidized goods (supplied by the PSF) to citizens based on the National ID number database. He said that the contract award process was unreasonably stalled. The card system would reduce the need for cash and engender the culture of using cashless cards, he added. Asked about the distribution of US$ 400 allowance to every family every year, the Audit Bureau head said that Libyan banks were very inefficient and questioned if this was corrupt activity by banks. He said the CBL had to tighten its control over them. He admitted that some bank employees had been implicated in corrupt activity and were benefiting from the corrupt status quo. This had contributed to the slow distribution of the US$ 400 allowance, but revealed that two-thirds had already been distributed. Shakshak insisted that distributing the US$ 400 allowance was the most equitable way of ensuring that all Libyan citizens received their share of hard currency and to depress demand for black market hard currency. He was unapologetic about the suspension of pre-paid debit cards such as Visa and Mastercard which had given cardholders huge hard currency allowances of up to US$ 15,000 at one stage. They had been abused by a corrupt minority denying the majority of their hard currency shares, he said. He valued the creation of the National ID database which would make it easier to distribute the next round of the US$ 400 allowance and make it easier to roll-out any future nationwide project. Shakshak was optimistic about the future, however. He felt Libya’s financial crisis was under control and would improve in 2018. He said although it was his job to accept the decisions of the executive, the Serraj PC/GNA in Tripoli, he had officially made it public that he disagreed with the way LC’s were being allocated. He agreed that financial reform which would include subsidy reform and Libyan dinar devaluation will have repercussions on citizens’ in the short term. He felt that short term measures also needed to be introduced in order to mitigate the expected effects of price rises on those with low and fixed income caused by financial reforms. Shakshak pointed to the increased state tax revenues in 2017 by 20 percent or LD 700 million above forecasts. This was partly due to increased Audit Bureau and Tax Authority efforts. He said the situation was better than 2015 and 2016 with state budget expenditure reduced to just 30 billion. He called for an urgent meeting of those active and relevant institutions in order to protect Libyan citizens and the assets of the Libyan state.